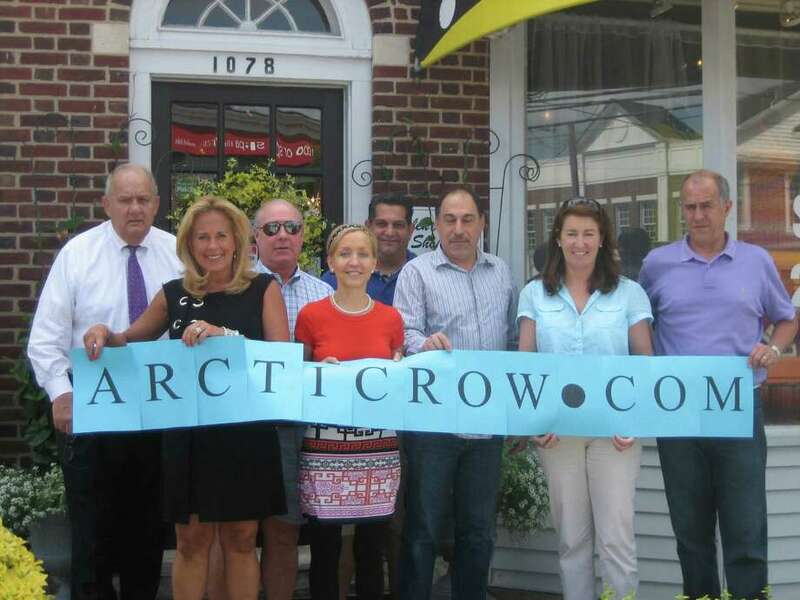 Twelve Darien businesses have joined forces in support of a historic expedition named Arctic Row that will set out next month on a 1,100 mile journey in a rowboat from Inuvik, Canada to Providenya, Russia to raise awareness of the changes in the Arctic climate and conduct scientific research. They also hope to inspire young people around the world to push the limits of their imagination through team work and by challenging themselves to accomplish the impossible. The team feels strongly about how health and fitness impacts empowered living. Led by Erica Jensen, owner of the Helen Ainson women's clothing boutique, Accent Picture Framing and Geary Gallery, Darien Toy Box, Wine Port of Darien, Life Solution Center of Darien,Neilson's Florist and Garden Shop, Darien Auto Specialists, Charles Michael Gallery, Darien Doughnut, Baywater Properties, Seasons Too and Abercrombie Burns McKiernan & Co. combined resources to support the crew. "We're proud to support the team and wanted to help make sure that they have the equipment they need to make the trip as safely and quickly as possible," Jensen said. Collectively, these four young men have rowed across the Atlantic ocean in a 19 foot rowboat in an unsupported 87 day, 3,500 mile row, climbed the seven summits, including Mt. Everest, unguided, swum the English Channel, cycled across the United States, paddled from Oahu to Kauai and are competitive Crossfit athletes. The four man crew, including team captain and former Stamford resident Paul Ridley, along with Scott Mortensen, Collin West and Neal Mueller, will row 24 hours a day in rotating two-hour rowing shifts without a support boat or resupply. Mortensen is an adventure filmmaker and will film this historic challenge for a future film and book. "Our exploration is about human-powered change, both positive and negative. As we marvel at the natural beauty of the Arctic, we are exploring how it's changing and helping to better understand how this ecosystem can be conserved and protected for future generations," Ridley said. "As explorers, overcoming adversity under extreme stress is part of our daily routine. So when we apply our mindset to such as relevant issue as climate change, it's exciting because the prospect of contributing to scientific understanding of the phenomenon is real." The 29-foot vessel was built with the latest rowing technology; the team will have two watertight cabins -- one for sleeping and the other for food and gear. The boat's instruments are powered by solar panels and a wind turbine mounted above the cabins, which will also charge batteries that connect to a VHF radio, GPS and navigation system. The team will have iPods for entertainment and use a laptop to track the weather, update their blog, twitter and Facebook on a daily basis throughout their journey. The Arctic Row team will conduct research along the way in partnership with Professor Russell Hopcroft of the University of Alaska Fairbanks. Twice-daily samples of plankton will be taken from a trawl deployed behind the boat and water temperature and salinity data will be monitored constantly from on-board equipment. "We are working with the organization Adventures and Scientists for Conservation to identify appropriate and impactful data collection opportunities that will advance awareness and understanding of pace of climate change in the region," team member Collin West said. Though such marine research typically costs Professor Hopcroft around $25,000 per day, the Arctic Row team says they're happy to do it for free. "We have a rare chance to combine a fantastic adventure with valuable research that will help scientists understand the implications of the recent dramatic rate of ice melt in the Arctic, and we're happy that our expedition can serve a greater purpose than just putting our names in the record books," Ridley said. The Arctic Row team has been given the privilege to carry the Explorers Club flag, and Explorers club members Paul Ridley and Neal Mueller hope to present the results of their research to the public upon their return. Team Arctic Row will keep followers updated via their blog, www.arcticrow.com and on Twitter @arcticrow throughout the journey.